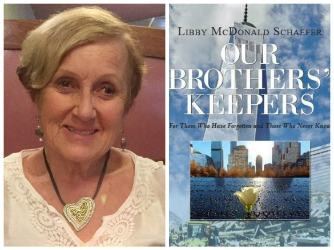 Please join us on Tuesday, February 26 for the launch of local author Libby Schaefer's fifth book, Our Brothers' Keepers: For Those Who Have Forgotten and Those Who Never Knew. which recounts the experiences of first responders and survivors of 9/11. Come early! Starting at 5 pm, there will be refreshments and socializing outside in our parking lot. Libby will speak inside the bookstore at 6 pm and sign copies of her books after her talk. The stories in Our Brothers' Keepers stand as a reminder to those who have forgotten the September 11, 2001 terrorist attacks on the World Trade Center and the Pentagon, as well as the failed attack and crash of United Flight 93 in Shanksville, PA. Told by survivors, responders, family members and onlookers, the stories also provide an insight into that day and the days that followed for those too young to remember and those who were not even alive on 9/11. Libby has written The Ladies of Punta Gorda, Memories of War: Women's Stories of Sacrifice and Struggle, Cooking with Grandma, and Memoir of a Streetwalker: A Paripatetic Journey of Reduction.